The first prototype of the home page for my organic chemistry class was constructed gradually for five years in the following manner. The first item I disseminated on the www-based system in 1998 was the assignment tasks for reviewing the class contents. 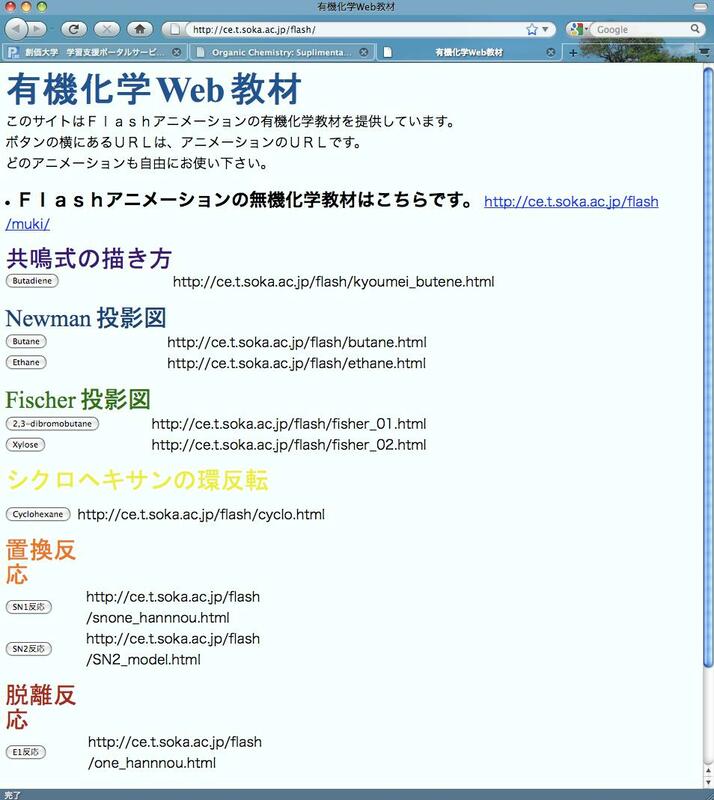 Since the www was not so popular in Japanese universities in those days, this activity also aimed at directing students familiar with the use of www. Since there was no www-based class-assisting system available, I prepared the www page and the www server by myself. After the students' task reports were submitted, my teaching assistant checked the students' answers and returned the reports to the students, while I disseminated the solutions to the tasks for further reviewing. Generally speaking, Japanese students were hesitant in raising questions in class, but rather eager in raising questions when they were encouraged to do so as part of the assignment. This often resulted in the repetition of answering the same questions again and again both to one student and another and in one year and the next. This repetition was difficult and frustrating for the teachers. In 1998, I encouraged the students to raise questions as part of their assignments, and disseminated commonly and repeatedly asked questions accompanied by the answers on the above www page. The next year, the collected sets of Q&A's were disseminated on the newly prepared Q&A web page, which was included in the prototype of the class home page. After two years of encouragement, more than one hundred of the Q&A sets were collected, which were categorized not only as organic but also as other fields of fundamental chemistry, such as physical, inorganic, and other fields of chemistry (Scheme 1). This was quite successful. The number of questions submitted with the task reports was much less, suggesting that students first came to seek for answers on the Q&A page. In addition, most of the questions were new and did not have answers posted on the page. The page is updated with new sets of Q&A's and revisions every year (Figure 1)1). Since 1994, I have provided students in my organic chemistry classes with handouts of the lecture notes that were prepared with Chem Draw, instead of drawing them on the blackboard. Every year, this caused a surplus of undelivered sheets of paper undelivered, because several students were absent or would not take the handouts. In 2003, with the popularization of the pdf readers such as Acrobat Reader and pdf files on www, I decided to deliver the lecture notes electronically on the www page for the class2). With this, the basic structure of my home page for the organic chemistry class has been constructed, which remains with revisions and modifications (Figure 2)3). The structural outline of this page is shown in Scheme 2. There are a few additional contents in this page. "Guide for Preparative Study" shows the day-to-day contents taught in the class, in relation to the chapters and sections in the electronic handout of "Lecture Notes". Students find the contents taught in the next class and may prepare for it. From the "Supplementary Materials" page, students can get the information of other web pages both inside and outside the university that are useful for their autonomous learning. "Review Problems for Exam" page collects the problems for past term-end examinations of this subject, which are reorganized to the corresponding chapters in the "Lecture Notes". With these problems, students recognize the expected achievement at the end of the semester and may make practice so as to prepare for the term end exam. In summary, the contents in this home page for the organic chemistry class are so designed as to help the class students' learning in various stages. Note, however, that all of these materials could be manuall distributed and parts of them were actually done in the traditional classroom settings. The development of computers and the Internet has just made it much easier for teachers to disseminate and for students to make use of them. They are not considered as "new" trends in education that were developed in this age of information and communication technologies (ICT). 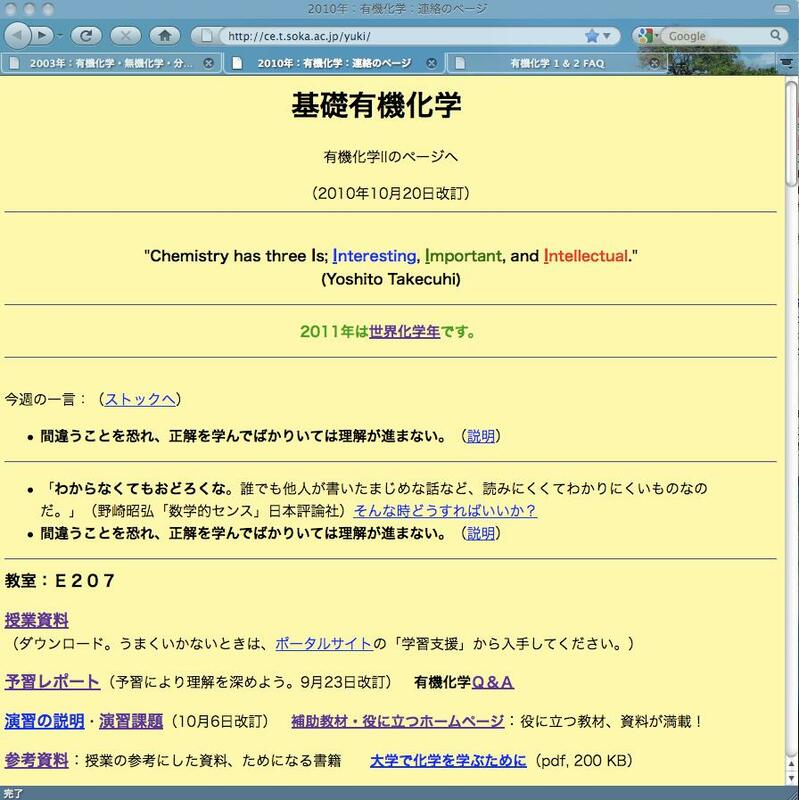 In 1999, I joined the project "Virtual Chemical Education (VCE)"4), which was headed by Professor Yoshito Takeuchi, a project of the IUPAC Committee on Teaching of Chemistry (CTC). This project aimed at using the Internet to make new educational tools. Among the various new functions of the Internet, we focused on its visual (animation), interactive (by-directional), and world-wide (beyond the restriction of distance in space and time) characteristics. One idea we explored was to apply the programmed learning system to the Internet. Programmed learning has long been known as an effective method of self-learning and was often used as a supplement to traditional class learning. It is possible for students to learn the content of their choice anywhere at any time with the textbook of well designed programmed learning materials. The learning extends beyond the restriction of space and time. Introduction of this system to the Internet would enhance interactive characteristics and enable far broader accessibility beyond the restriction of space and time to it. We already have a well-designed textbook of programmed learning on organic stereochemistry, a best seller written by Professor Takeuchi5). Thus, we reconstructed the problems so as to fit the web-based programmed-learning system that was designed and prepared by Moriya6) with cgi and disseminated its Japanese version in the class home page in 1999 (see also Scheme 2)7). Later, their contents were translated into English and internationally available in 20057). Figure 3 A typical set of question and response pages in the programmed learning system7). (a) The question page, (b) the page displayed when students choose a correct answer, and (c) the page displayed when students choose wrong answers. Figure 3 shows an example of the question-response set in the system. Students read the question page (a) and choose one of the branches. If the choice is correct, then the page (b) is displayed and students can proceed to the next question. If the choice is wrong, then page (c) is displayed with the correct answer and a brief explanation. Then the student may either proceed to the next question or visit the relevant online textbook. Thus, depending on the understanding of the students, the system may guide them in an appropriate direction. As part of the effort on the VCE project, I developed two java applets, which were aimed at understanding of fundamental issue in stereochemistry, with the technical supervision of Dr. Yoshida. 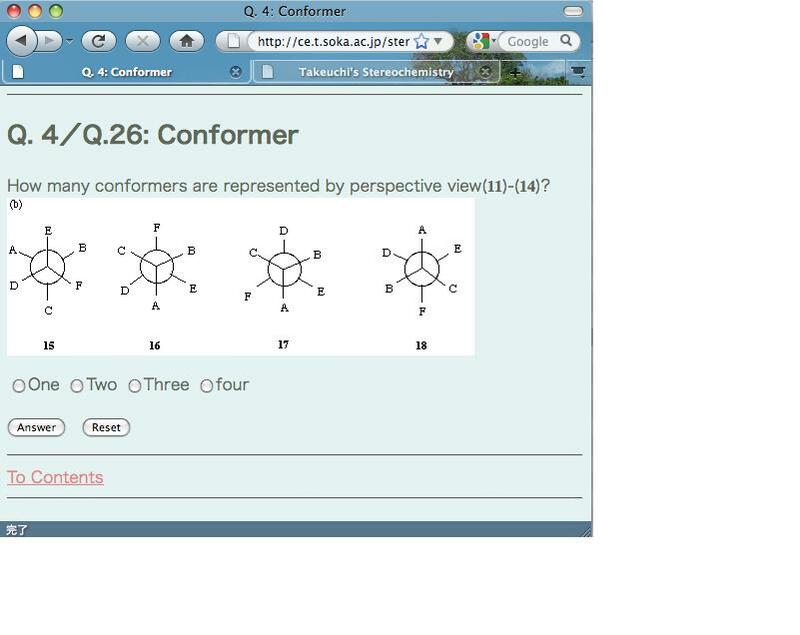 One was related to the conformers of butane (Figure 4)8). 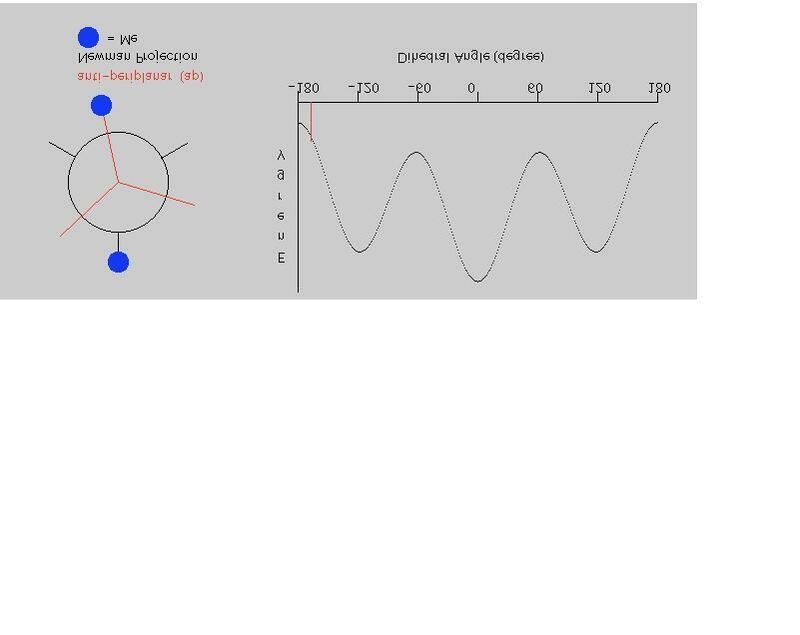 This animation displayed the relationship among the torsion angle, steric energy (right), and the name of the conformer (left, in red letters). The other was an interactive tool showing the dependence of the molar ratio of isomers in equilibrium (A <-> B) on their free energy difference (delta G) and temperature (Figure 5)9). Students could change the delta G and temperature in the equilibrium by a clicking on the respective bars to see how the molar ratio changed with them in an interactive manner. The stereoscopic manner in the structure of organic molecules and dynamic manner of organic reactions are not easy to comprehend if taught only with the textbooks or on the blackboard. Animations is expected to serve as a good aid for students by raising their imagination and understanding of many other fundamental concepts and phenomena in organic chemistry. The animations complement learning with textbooks and in the class. Among the teaching and learning contents shown above, the Q&A and Programmed Learning cgi seem to have been most successful, as is depicted in the access report of the ce.t.soka.ac.jp www server11). 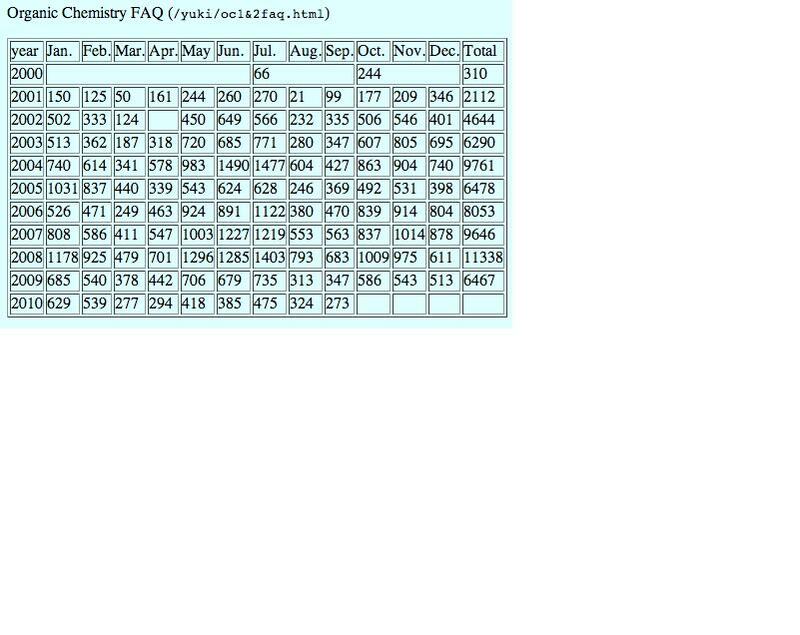 Figures 7 and 8 indicate the monthly number of accesses to the Q&A and cgi files. Every year since 2003, more than six thousand students have visited the Q&A site (Figure 7), which corresponds to sixteen visits per day. Although the number of accesses to the programmed learning cgi exceeds forty thousands hits every year since 2003, more careful evaluation of the numbers is needed. Each visit to any query is counted as one access to the quest.qa file. Supposing that one student has accessed to twenty queries (approximate number of queries in one chapter) in one visit, the forty thousand corresponds to the two thousand visits per year and five to six accesses per day. Most of the work described here was done more than five years ago. Considering that the site is open outside the university, the number of accesses to the pages is not very large. Nevertheless, they helped a relatively large number of students who were learning organic chemistry every year, not only in Soka University but also in Japan, and will continue to do so in the future. I will be happy if my experience serves as a clue for younger more technologically savvy teachers, to develop new teaching strategies in organic and other fields of chemistry in many countries. I give my hearty gratitude to Professor Yoshito Takeuchi and Dr. Hiroshi Yosida for their inspiring and encouraging me with these works. I also thank Mr. Takashi Moriya (Programmed Learning cgi), Dr. Naoki Yamamoto (the first Flash animation), and all other students whose names appear in the web pages in References. 1) "Organic Chemistry : Frequently-Asked Questions" (in Japanese), url = http://ce.t.soka.ac.jp/yuki/oc1and2faq.html. 3) "Organic Chemistry" (in Japanese), url = http://ce.t.soka.ac.jp/yuki/. 4) Y. Takeuchi, H. Hosoya, H. Yosihda, and M. M. Ito, Pure Appl. Chem., 71, 825-834 (1999). 5) Y. Takeuchi, "Introduction to Stereochemistry-A Programmed Study" (in Japanese), Kodansha, Tokyo (1980). 6) T. Moriya, M. M. Ito, Y. Takeuchi, and H. Yoshida, 16th International Conference on Chemical Education (16th ICCE) Book of Abstracts, 308 (2000). 7) "Professor Takeuchi's Stereochemistry-A Programmed Study", url = http://ce.t.soka.ac.jp/stereo/index-j.html. 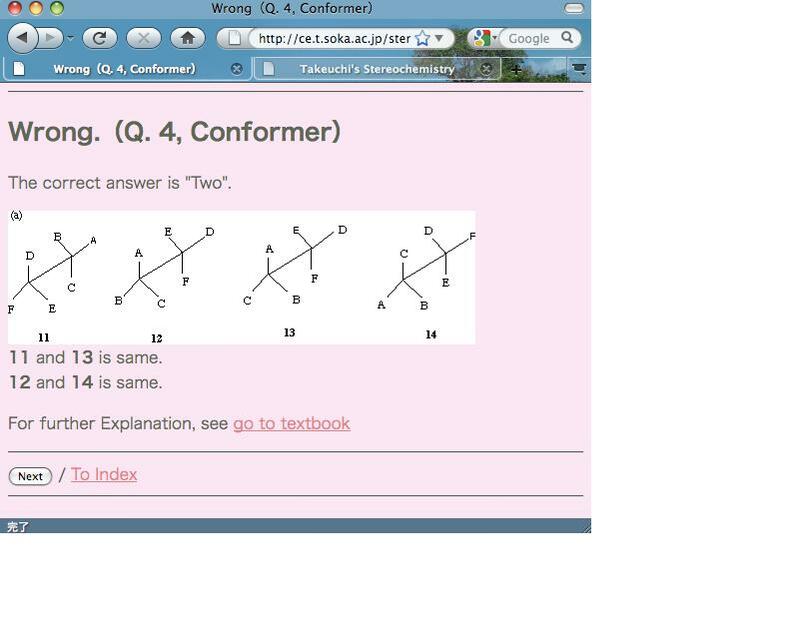 8) "Conformers and their Nomenclature", url = http://ce.t.soka.ac.jp/stereo/Ch2/icce.html. 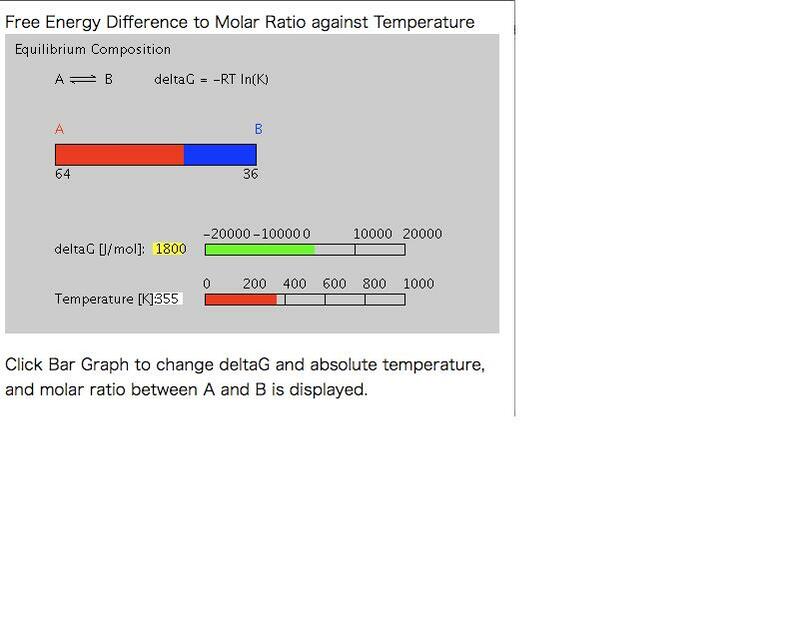 9) "Free Energy Difference to Molar Ratio against Temperature", url = http://ce.t.soka.ac.jp/stereo/Ch2/stereo2.html. 10) "Flash Animations for Learning Organic Chemistry", url = http://ce.t.soka.ac.jp/flash/; M. M. Ito, 2005 International Chemical Congress of Pacific Basin Societies (Pacifichem 2005), COMM 84 (2005). 11) "CE Web Server: Access Report", url = http://ce.t.soka.ac.jp/report/.